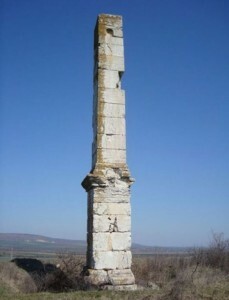 Archaeologists from the Regional Museum of History in the city of Veliko Tarnovo in Northern Bulgaria are hoping to restart the archaeological excavations of a surviving 14-meter Ancient Roman Obelisk near the towns of Lesicheri and Musina, which was part of a Late Antiquity family mausoleum and shrine. The Roman Obelisk near Lesicheri, Pavlikeni Municipality, is one of the tallest surviving ancient archaeological structures in Bulgaria. It was part of the memorial tomb (mausoleum) of Quintus Juliuis, a Roman aristocrat from the nearby large city of Nicopolis ad Istrum, who lived in the 2nd century AD, as testified by an inscription. Later the mausoleum became a heroon (a shrine dedicated to a deceased Ancient Greek, Thracian, or Roman hero), which existed until the 4th century when the Roman Empire was Christianized, while its provinces in today’s Northern Bulgaria were overrun by barbarian invasions. Interestingly, the memorial tomb-turned-shrine originally had two obelisks but only one of them has survived; fragments from the other were identified nearby when the site was first explored by geographers and archaeologists in the 19th century. Learn more about the mausoleum and Roman Obelisk near Bulgaria’s Lesicheri in the Background Infonotes below! The project for the restart of the excavations of the Obelisk site (which was excavated for three seasons in the 1980s) belongs to the Old Capitals Association, a NGO, which plans to donate it to Veliko Tarnovo Municipality so that the digs can be carried out by archaeologists from the Veliko Tarnovo Regional Museum of History, reports the Trud daily. The projected cost of the excavations is BGN 25,000 (app. EUR 12,500) but the funding is still be secured. The same reports explains that the History Museum in Veliko Tarnovo plans to apply for a total of BGN 200,000 in funding from the Ministry of Culture for the excavations in several major archaeological sites in 2016. The requested funding might seem unrealistic given that the Ministry’s entire annual budget for archaeological digs in all of Bulgaria was a meager BGN 500,000 (app. EUR 250,000) in 2014. With whatever funding is awarded by the Bulgarian Culture Ministry, the Veliko Tarnovo Museum plans to continue the exploration of the prehistoric settlements in Hotnitsa, Petko Karavelovo, and Dzhulyunitsa; the Ancient Roman city Nicopolis ad Istrum, and a medieval monastery in the Frankish Quarter of the medieval Bulgarian capital Tarnovgrad, at the foot of the Tsarevets Hill Fortress. Another major Ancient Roman city in Veliko Tarnovo District, Novae on the Danube near today’s Svishtov, will also be excavated by the archaeologists from the same Museum. The archaeologists from the Veliko Tarnovo Office of the Sofia-based National Institute and Museum of Archaeology are to continue their excavations in three sections of the Trapesitsa Hill Fortress, the other citadel of medieval Tarnovgrad alongside Tsarevets. The Ancient Roman Obelisk located between the towns of Lisecheri and Musina, Pavlikeni Municipality, Veliko Tarnovo District, in Central North Bulgaria is a surviving structure from a memorial tomb (a mausoleum) of Quintus Julius, an aristocrat from the glorious Roman city of Nicopolis ad Istrum located nearby, who lived in the 2nd century AD. It later became a heroon, i.e. a cult shrine for a deceased hero, which existed in the 2nd-4th century AD. Today it is still known among the locals as a Markov Kamak (“Marko’s Stone”). It is about 14 meters tall, and is consists of 15 massive stone blocks placed on top of one another. It is one of the tallest preserved ancient archaeological structures in Bulgaria. A second identical obelisk existed nearby; its ruins were identified by visiting geographers and archaeologists in the late 19th century. At present, the sole surviving obelisk is hard to access because it is located about 300 meters off the nearest road (but is nonetheless visible from it). The Roman Obelisk near Bulgaria’s Lesicheri was first described by Bulgarian writer and politician Petko Slaveykov in the 19th century. In 1871, it was explored by Austro-Hungarian geographer and archaeologist Felix Kanitz who identified the ruins of a second obelisk which had collapsed earlier. According to his description, he found nearby fragments from marble reliefs and the ruins of a monumental building. Kanitz wrongly concluded that the Obelisk was part of the aqueduct bring water to the Roman city of Nicopolis ad Istrum from the Musina Cave. Some 30 years later, the site of the sole surviving Roman Obelisk was also explored by the Czech-Bulgarian brothers Karel and Hermann Skorpil, the fathers of modern-day Bulgarian archaeology, who were also the first to photograph it. They hypothesized that the obelisk was part of a colonnade (arc) of triumph erected in honor of Emperor Trajan’s (r. 98-117) victory over the Dacians north of the Danube, at about the same time when the Roman city of Nicopolis ad Istrum was constructed not far to the east. They also recorded the local legend which led the locals to call the Obelisk “Marko’s Stone”. Interestingly, the legend does account for the collapsed second obelisk. According to this tale, two local heroes, one named Deli Marko, were competing for the heart of a woman living in Nicopolis ad Istrum (today’s Nikyup). Marko was supposed to erect two tall pillars while the other man had to build an aqueduct to Nicopolis ad Istrum. The woman liked the second hero better so she tricked Marko (who was winning) into falling asleep; meanwhile, his rival completed the aqueduct and won. Upon waking up and realizing the deceit, Marko threw one of his boots and brought down one of the obelisks he had built. His boot ricocheted and fell all the way across the Danube, in Wallachia. The site of the Roman Obelisk was excavated for three seasons in the 1980s by archaeologist Ivan Tsarov, presently (2016) the Director of the Veliko Tarnovo Regional Museum of History, who discovered parts of a pediment, a slab with relief decoration, fragments from friezes, including the lower half of a depiction of the face of Gorgon Medusa, a lion statue, a damaged depiction of the Thracian Horseman (also known as Heros, the supreme deity of the Ancient Thracians), a Ionian capital, and inscription fragments. These artifacts are part of the collection of the Veliko Tarnovo Regional Museum of History. According to Tsarov’s model reconstruction, the mausoleum with the two obelisks was built on top of a stone podium with a monumental staircase; its entrance was “guarded” by the statues of two marble lions. (The left lion statue was found during the archaeological excavations, while the right statue is lost.) The statue of the Thracian Horseman was placed on a special pedestal before the staircase. It is possible that the face of the statue had the facial features of the deified Quintus Julius. It is also possible that inside the mausoleum there was a life-size statue of the Roman aristocrat as testified by a discovered fragment of a relief of a human back. The mausoleum of which only the sole Roman Obelisk near Bulgaria’s Lesicheri survives was destroyed in the 4th century AD – either in a barbarian invasion, or as a result of anti-pagan measures after the Christianization of the Roman Empire. The territory of the town of Lesicheri also features remains from an Antiquity temple and the aqueduct supplying Nicopolis ad Istrum from the Musina Cave. These structures were independent of the Roman Obelisk and the heroon it was part of. The Roman Obelisk and the memorial near Lisicheri resemble similar Ancient Roman structures preserved in North Africa. This entry was posted in Archaeology, History. Bookmark the permalink. ← Combat Trauma is Nothing Like in Classical Antiquity – So Why Are We Still Treating it as Such?